IN the Game of Thrones series of books, author George RR Martin is fond of describing lavish medieval feasts. But as anybody who has read the books or watched the hit HBO show will know – if you’re invited that’s not necessarily a good thing. Which most certainly isn’t the case at Ballygally Castle which serves a special themed afternoon tea matching the lavish feasts – but thankfully not the post-meal entertainment. Perched on the tip of the picturesque Causeway Coastal Route, the 17th century castle is the perfect location for exploring the landmarks, sights and locations from the television series – or an excellent pit stop for a relaxing break. 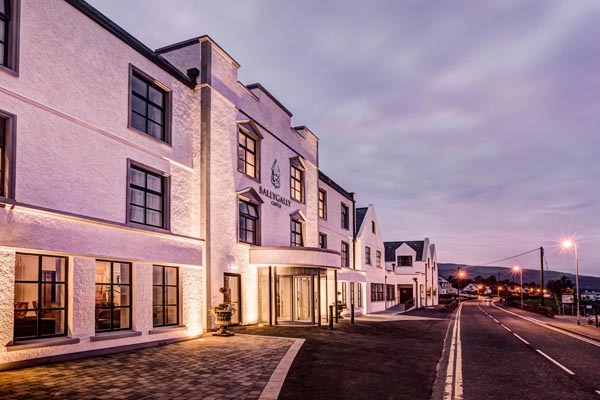 Ballygally Castle is the perfect base to map out and explore the neighbouring Glens landscape used to capture and recreate to perfection the fictitious kingdom of Winterfell, the Iron Islands, King’s Road and Stormlands from Cairncastle, Cusehendun Caves, Slemish Mountain and the village of Glenarm. Booked in for an overnight stay and nestled comfortably at a window seat overlooking Ballygally Bay, my companion and I settled down to taste what delights lay in store from head chef David Mellor. Wooden serving boards of ‘Little Finger’ mini chicken Caesar wraps, ham and ‘Targaryen’ mayonnaise on batch bread and ‘Hordor’s’ pulled pork brioche were served, promptly devoured and judged delicious. And how about ‘Jon Snow’ cakes, oven-baked scones served with County Armagh jam and fresh cream and ‘Baratheon Bread’ – slices of toasted fruit loaf were packed full of currants and perfect for a topping of homemade butter? As refills of freshly brewed Thompson’s Tea and Bewley’s coffee were delivered by the hotel’s pleasant and professional staff, the board was still heaving with sweet treats as we tucked into a selection of themed pastries with such inventive designations as the heavenly Winterfell Jaffa Cake, the Kingslayer Cupcake resplendent with frosting and giant Milky Bar button. And for the final flourish – with room permitting, which it was – the Dothraki Trifle with mini dragon’s egg. As we were tucking into our sumptuous afternoon feast, coaches with Thrones fans were pulling up to check in, use the facilities or have a selfie taken at Ballygally’s specially commissioned and intricately carved Game of Thrones door made from trees blown down at the iconic Dark Hedges site in Stranocum during Storm Gertrude. Ballygally Castle really is the ideal resting place, whether you’re a serious fan and want to immerse yourself in some serious Game of Thrones locations or just want to take it easy around the beautiful coast and enjoy the stunning scenery. Ballygally Castle’s Game of Thrones Afternoon Tea is served 2pmm to 5pm Monday to Saturday and 3pm to 5pm on Sundays. Due to current demand, please allow 24 hours notice for reservations.